As part of the inaugural RTÉ Radio 1 Folk Awards, RTÉ Arts and the Documentary On One team have come together to tell the story of one of the greatest albums ever made. I was 23-years old and living abroad in 1998, when an older work colleague decided my musical horizons needed broadening. She gave me five essential albums that I had to hear. One of those she left on my desk was Van Morrison’s 1968 record, Astral Weeks. My colleague had no idea that Van Morrison was Irish – she just loved the record. I, being Irish, knew a bit about Van Morrison, but I’d never even heard of Astral Weeks. Almost immediately, it cast a spell on me. I started reading up about it and was astounded to learn that Van was only 23 – exactly my age then – when he recorded it that record. How could a 23-year old possibly have written those apparently profound, mystical lyrics? The album stayed with me, and I started to noticing it popping up on lists of the most important albums of all time in publications like Rolling Stone, the London Times, and Time Magazine. I assumed it had always featured on those lists, in the same way as, say, Sergeant Pepper, from the previous year. 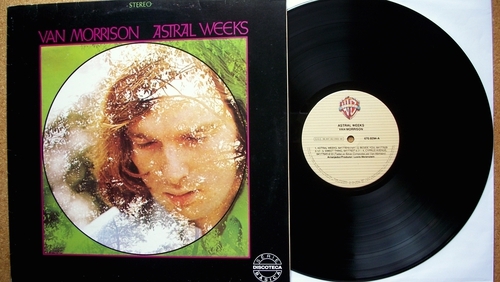 Later I would discover that Astral Weeks only finally sold its 500,000th copy in 2001 – thirty-three years after it was made. When I went digging a little more, I was surprised and disappointed to learn that Van Morrison himself had rarely spoken in any detail about the record, and that – when he did – he was completely dismissive about its significance. My curiosity was piqued. So, last year, when I spotted that the fiftieth anniversary of the album’s creation was approaching, I decided the best thing was to try to track down the people who were close to Van that year – in 1968 – to get their account of the album’s creation. Much has been said by the record’s many fans about the meaning of its impressionistic, ambiguous poetry. But the question we wanted to ask in The Summer of Astral Weeks was not about what Van meant in those eight remarkable songs, but rather how the album even came to be made in the first place – in a year that began with Van Morrison living in poverty, facing deportation and threats from New York mobsters. "It was a very scary time," Van’s girlfriend at the time, Janet, tells us. "We were in a terrible position. We had no money. Still Van wanted to continue on and make his music." That the couple was penniless was all the more galling, given that his song Brown Eyed Girl had been a huge hit just six months earlier. But Van was tied into a famously-bad recording contract with a music company that Janet recalls "was filled with underworld types," who chased the couple out of New York, and reported Van to US Immigration because his visa had expired. Things were looking bleak for Van, both personally and professionally. But skip forward to the end of 1968, and Van Morrison had entirely turned his life around: he was now married, living comfortably in New York, had signed a deal with Warner Brothers Records, and had recorded an album that is now seen as one of the greatest achievements in music history. How on earth did that happen? And who were the people who helped Van pull it off? Van Morrison himself rarely speaks about the album or that time in his life, and any time he does he sounds distinctly ill-at-ease. So, in the summer of 2018, my fellow producer, Tim Desmond, and I headed off – funded by the Broadcasting Authority of Ireland - to Boston, New York and Los Angeles. The idea was to track down nine people, each of whom played a big part in the Astral Weeks story. First up was the woman Van Morrison married at the very start of 1968 – the 20-year old he christened ‘Janet Planet’, and whose writings, image, and voice all appear on Van’s records from that time. The couple would later go their separate ways in 1973, but in the programme Janet gives us a fascinating insight into the creative process Van used in writing the songs at their kitchen table that summer... not to mention, into the state-of-mind of the man himself in ‘68. "We had this tape machine, and we kinda developed this working style in New York," Janet told us at her home in Los Angeles. "Because it was really streamlined and easy for Van to sit with his guitar, and sing and play, and I could sit very close to him with the machine and I could record about twenty minutes at a time really. Then we’d go back and listen to it. Then he would decide: he’d say ‘I like that, I like that, I don’t like that, that’s stupid. And then I’d say, ‘well, I like this’. Then I would re-write those parts, and then he would do the whole process again. It was amazing. It was hypnotic. The songs we were working on that whole time became Astral Weeks. It was really the experience of a lifetime, I have to say." Amazingly, the band members Van assembled that summer – Tom Kielbania (bass), John Sheldon (guitar), Joe Bebo (drums) and John Payne (flute) – have never met up since 1968. In The Summer of Astral Weeks, we bring together all four in the basement of the Boston club where they played that summer – the very spot where Van’s band first went acoustic, as identified earlier this year by Ryan H. Walsh in his superb account of the story, Astral Weeks – A Secret History of 1968. In New York City, we get a different perspective on things from three new characters – two famous jazz musicians (Warren Smith, percussion & Jay Berliner, guitar) and the sound engineer (Brooks Arthur) – who were there for those legendary recording sessions in September and October 1968. When we asked them to meet us on the site of the recording studios used in ’68 for Astral Weeks, we were really hoping they might consider jamming together on some of the tunes from the album. "My first impression was how shy he was," remembers Warren Smith, who had by 1968 already played with the likes of Miles Davis and Nina Simone. "He did very little talking. Very quiet. He was almost bashful in front of the other musicians." Jay Berliner says that, despite recording the songs with Van, he doesn’t consider that he really met him: "He just went into the isolation booth and I didn’t really see much of him after that. But he wasn’t shy when he sang." Finally, we tracked-down the now 90-year old Warner executive, Joe Smith, who signed Van Morrison up for Astral Weeks – but not before taking his life in his hands to make that happen. "The deal was we had to give the ‘managers’ $20,000 to buy his contract, and deliver it to them on the ninth floor of a warehouse at night when it’s dark" Joe recalls. "So I took a taxi over there – I didn’t think it was a good neighbourhood for a limo. I get there and there’s a couple of guys downstairs at the door. And I’m walking up the stairs certain that somebody’s gonna hit me on the head! But I gave it to the guy: $20,000 in cash to sign Van Morrison to a contract." Over the time we spent making this programme, and speaking to those who were close to Van Morrison at the time of Astral Weeks, we didn’t really come to any firm conclusions as to why he always seems so uncomfortable discussing this particular album - that so many other have fallen in love with: does he feel, perhaps, that Astral Weeks has overshadowed the rest of his music? Is it that those eight songs were the product of a very traumatic time in his life, that he’d prefer to forget? Or is he still angry at how Lewis Merenstein, the producer, made those songs sound – by adding horns and strings in post-production? The Summer of Astral Weeks is a completely unlikely story of love, stress, intimidation, and triumph. And ultimately it’s the story of how a 23-year old introvert from East Belfast overcame the Mob, US Immigration, poverty, and his own tricky personality, to make one of the most enduring albums ever recorded. The Summer Of Astral Weeks, RTÉ Radio One, Saturday 11 October at 2pm - listen to more from Documentary On One here. The inaugural RTÉ Radio 1 Folk Awards will take place in Vicar Street in Dublin on 25th October 2018 - find out more here.